So remember how I said I wanted to try some DIY projects? Well, I actually did it!! 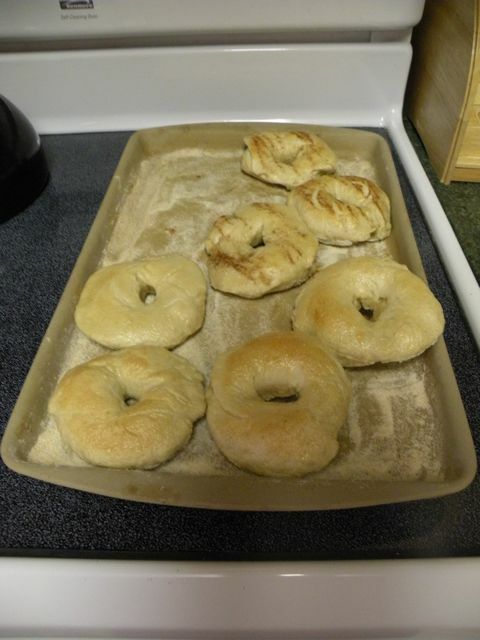 This past week, I decided I would attempt to make bagels using my bread machine from a recipe I got online here. We love bagels at our house and since they aren’t the most cost effective thing to buy, I thought I would give a hand in trying to make some cheaper. The result? They were delicious!! And, honestly, they weren’t very time consuming to make either! There are three drawbacks to them though, that will probably limit how much I make them: 1 – they don’t have preservatives so they don’t keep super well (probably only best to make when we have company and will be eating them all) 2 – they are so good you are tempted to eat them all in one or two days! and 3 – they call for bread flour, which I couldn’t find in a generic brand so it cost over $3.50 to buy. While I didn’t use all of this bread flour, I did use a good chunk and am not sure how many recipes I could make out of this flour. If I can make multiple recipes, then it is definitely more cost effective. If I can’t, then buying them is more cost effective. I would love to find some bread flour that is generic and much cheaper. So, we shall see. 1 – Great sermon at church! I love when the Lord shows you amazing truths through this Word and through a preacher of His Word that He brings to remembrance throughout the week and causes you to mediate on. 2 – Using freecycle (a email group that seeks to recycle and give away things that you don’t want but don’t want to end up in a landfill), the Lord gave us a playhouse for outside that just needs a good scrubdown. And did you catch the part about FREE? It is faded for the sun, but considering the price we paid, and that we will also be putting it outside, we could care less. This will be a great present for Kinsley’s birthday next month! 3 – It SNOWED!! Yes, you heard me right. It snowed in North Carolina. When everyone keeps telling us that NC never gets snow. 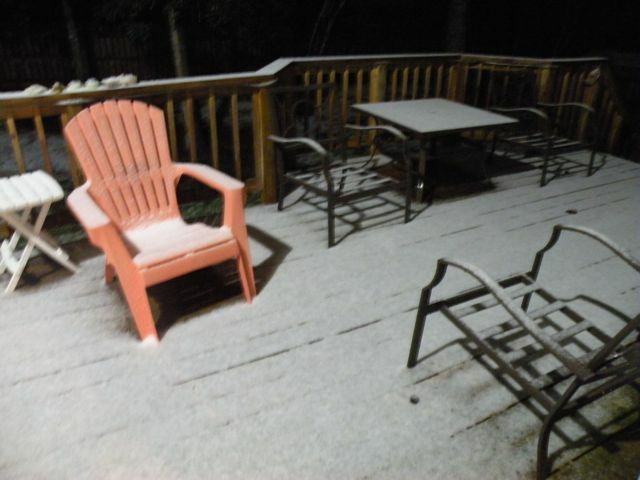 Here is a picture of our deck with the snow on it. Granted, it was just a light dusting, and there wasn’t much left in the morning, but hey, I will take it. It definitely make me like North Carolina even more!! 4 – A great coaching appointment with our faculty volunteer at Bladen Community College. It is fun to hear how the Lord is working and moving on their campus with both faculty and students! I was also really anxious about this appointment because there were some hard truths that were going to have be discussed but our faculty volunteer was super receptive and teachable, and I am so grateful the Lord worked it out! On the agenda this week: Birthday celebration (last year in my twenties!) with Kinsley and my good friend Kai (since Ed will be on campus leading Bible study and hosting an info meeting for starting Impact at Methodist University), sewing some pot holders (never done this before! ), doing a fun activity with Kinsley involving fishing for magnetic letters, reviewing a leader’s application (yah for new leaders being raised up! ), potentially meeting with some students and faculty at Wake Tech, and much more. I will try and post updates on some of these things. Not because I think you are on pins and needles to hear what is happening in our lives, but because writing and posting about these things keeps me accountable to following them through. Thanks for holding me accountable, even if you didn’t know you were doing that!